West Palm Beach, FL - A record-setting catch earlier this week is moving the South Florida Water Management District's (SFWMD) Python Elimination Program closer to another significant milestone. 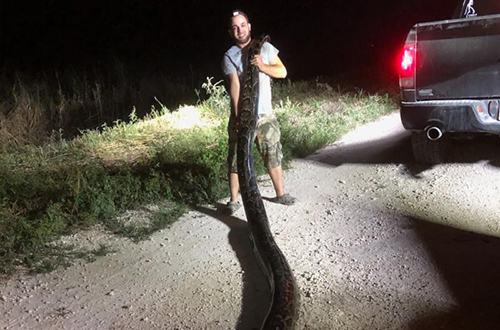 Kyle Penniston, of Homestead, made the solo capture of a 17-foot, 5-inch female Burmese python while hunting on SFWMD lands in Miami-Dade County late Monday night. The mammoth snake weighed in at 120 pounds. It's the third caught as part of the program that measured more than 17 feet. With the record catch, SFWMD's python hunters have now eliminated 1,859 of the invasive snakes on District lands, stretching a combined length of more than two miles and collectively weighing more than 11 tons. Penniston is currently second among the hunters, with 235 snakes eliminated. Brian Hargrove, a Miami native, has dispatched the most, with 257. For more information on the Python Elimination Program, visit www.sfwmd.gov/pythonprogram.